MFT Summer School is back and so far I've finished 3 lessons. A few days ago I smooshed a variety of green Distress Inks on watercolor cardstock & spritzed with a green shimmer mist. I die cut MFT Spring Wreath wreath & discovered there wasn't room to cut a second one, as I'd planned. Instead, I die cut the 2 little sprigs several times & began with a project using them. I die cut & stamped the tag from MFT Tag You're It. 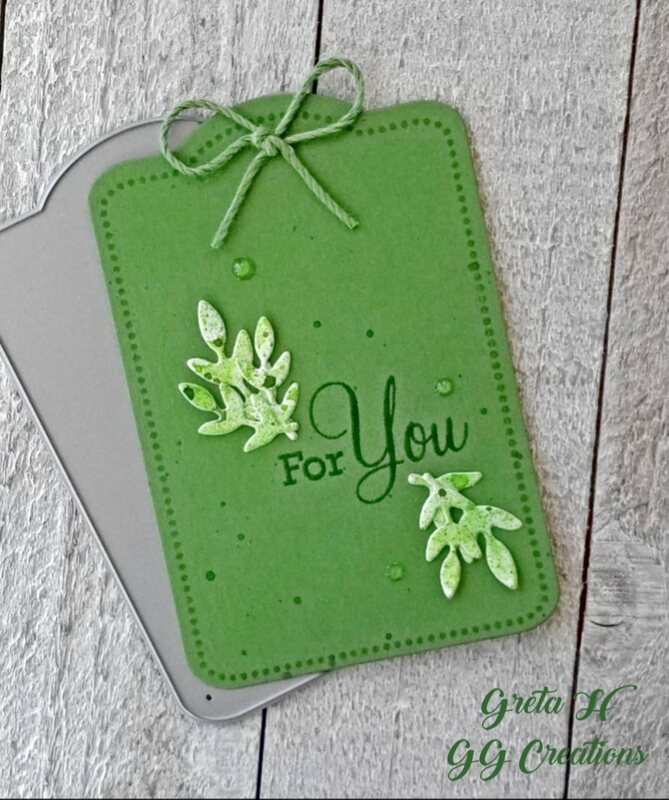 The sentiment from the same set was stamped in green & Versamark so I could heat emboss it. Then I arranged the little sprigs & added green Nuvo Drops, shimmer spray splatters & a green twine bow. This will go to my sweet neighbors with some of my homemade applesauce. I'm also entering SSS Monday. Day 2 is Focal Point. I had such fun stitching another MFT tag on our last camping trip. It was my first time to do something different for the background & I love the look of my white stitched lines. May look black, but actually it's green, white & gold--a favorite Christmas color combo. 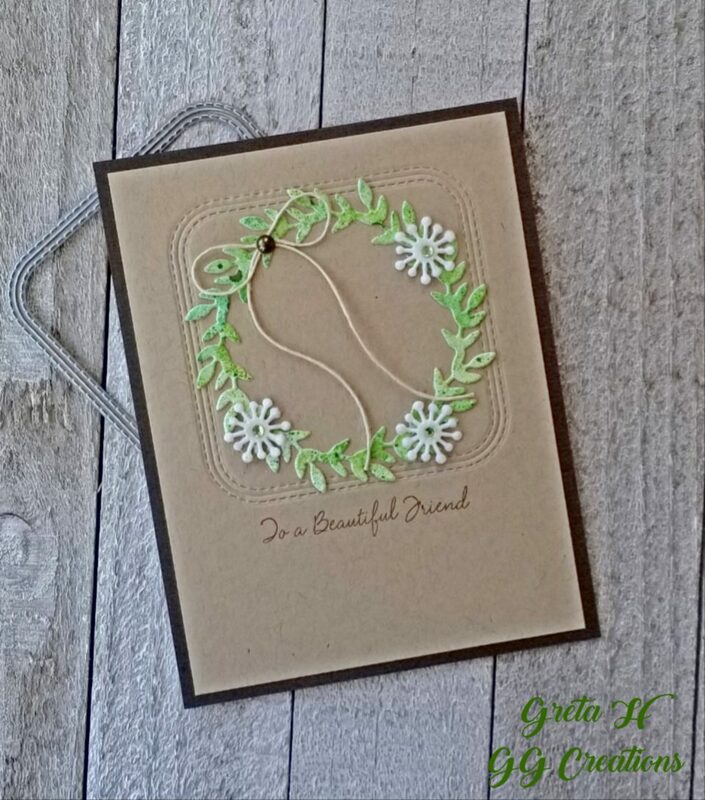 The green mat is textured cardstock & the white ribbon with the lines seemed a good match. I added the PTI Tiny Tag for the sentiment as I really didn't want to cover up any of my tag--haha! I think the gold mat & the raised tag makes the focal point stand out even with a solid background. 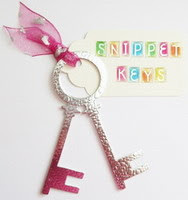 I'm also entering The Snippets Playground. Day 3 is Visual Triangle. I used the wreath die cut from the smooshed panel along with white felt flowers (attached to cardstock) from MFT Prima Donna Petals. I added tiny gems to the flower centers & arranged them for the visual triangle. I dry embossed MFT In & Out Stitched Rounded Square die into Classic Kraft cardstock, stamped the sentiment from MFT Spring in brown ink & mounted it to a brown panel. Love this twine & thought it was perfect for the look of this card. Tried to leave the bow plain, but gave in & added the brown pearl. I'm also entering Retro Rubber with die cut, green, leaves & the sentiment from my first MFT stamp set which I've had for probably 8-10 years. Two more lessons & I already have some ideas. Gotta do chores first--yuk! Thought I'd leave you with this cute picture of Fritz. He managed to get the blanket in his bed over his back & head. Then he walked slowly over to our chairs with this look on his face, as if to say--Momma, help! So funny! Thanks so much for taking time to stop by. I like your wreath card, Greta. The colours you've chosen give it such a country feel event though your design is sophisticated. The felt flowers are lovely and the placement of them perfect. Thank you for joining in with us at Retro Rubber Challenge this week. I love them all. Great work. love love your wreath card, Greta - but all three cards are fantastic - A+ homework!! Just love your tags and card, Greta! Pretty wreath and sprig tag and I love the stitched Christmas tree! Sweet Fritz - he looks adorable with his blankie!! A+ all around Greta! Those tiny sprigs are just darling and I love the pretty fresh wreath. And just don't even get me started on your amazing cross stitched tree! Sweet little Fritz, what a priceless photo! Beautiful cards, Greta! I love Fritz!!!!!!!!!!!!!! Kisses, my friend. 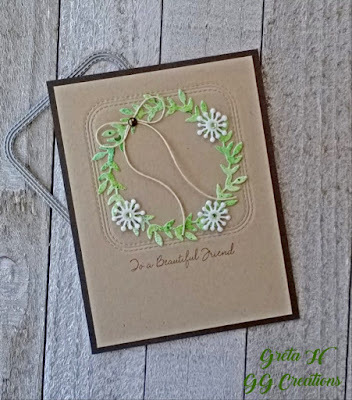 Great wreath card! Love the embossing detail. And little Fritz looks so cute! Thank you for playing with us at Retro Rubber and we hope you can join us again soon. I love all your projects! Wish I had the time to play along. I really like that wreath card. It caught my eye. Have a great day! All thre are pretty but your stitched panel realy stands out and how lucky the person who has that on their gift - if you dare part with it. Yes, Fritz certainly does have that appealing look on his face. Poppy has taken to messing up her bed since her op....I say bed, she has a rocking chair with a soft blanket and seems to do it to get a comfy position. Cute and lovely projects, I like this CAS look and the less is more style. Your dog is so funny! Thank you for joining Simon Says Stamp Monday Challenge. What gorgeous creations Greta... I've missed visiting you but you know you are always in my thoughts. Love the picture of Fritz!! My baby is back home and recovering thankfully but he was in a sorry state I can tell you! Enjoy your day my friend! I don't know what to say first! Love those cards. The stitching is just gorgeous, love the green tag with sprigs and the wreath is so pretty. Fritz is just adorable with his blanket. He looks so sad that this happened to him! Sweet tags Greta...but I have to say that Fritz with his blanket steals the post! your tag and cards are fabulous, greta! love that sweet little cross-stitched tree and the beautiful wreath! super cute photo of fritz! Oh, so pretty tag and cards! 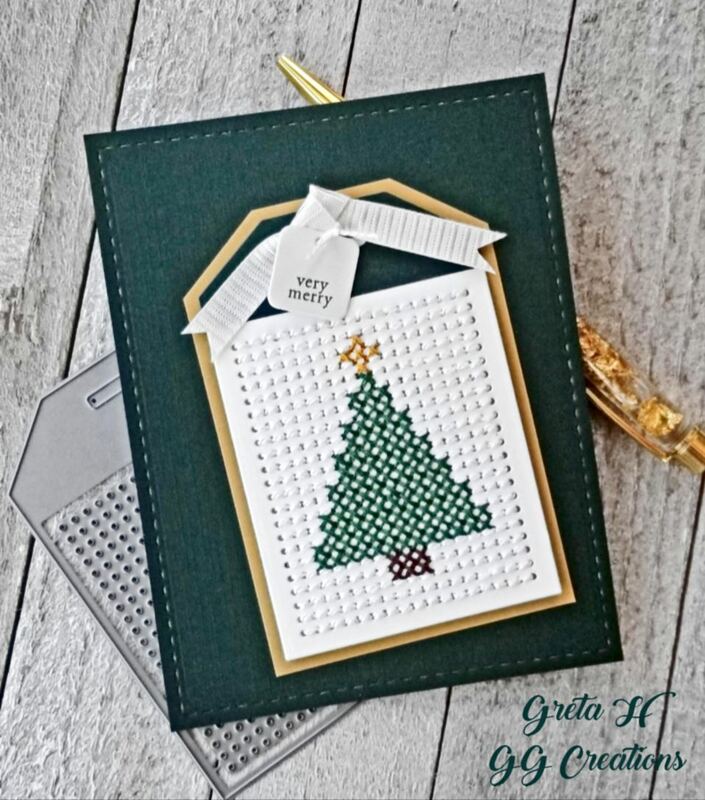 Love the cross-stitched tree (I've got to do some cross stitch!) and that sweet Fritz! You are so good to be so far along with your homework for summer school. I hope to catch up this week. Your tag is darling and your neighbor will love it. Your stitched tree is definitely an eye catcher and makes for a fabulous focal point. Your wreath is darling with the three blooms making your visual triangle. Three charming projects, each with a different theme. I like them all and admire the work needed to stitch the little tree. The wreath on the Kraft has a homespun look which I love too. Gosh, they are all just lovely. Look forward to seeing the next round of homework! Greta, I just adore the softness of this wreath you created, the embossed frame around it is the most perfect detail. Using Kraft card stock gives your beautiful design a charming Country feel, love the sweet white flowers and that perfectly tied twine bow. Thank you for playing along with us at RETRO RUBBER, we hope you play again next time. Oh, by the way, your doggie is just adorable, looks like he is helping you in your house cleaning chores. Super sweet picture, thank you for sharing. These are just delightful!! I love the little wreath especially; the pearl is a nice touch to that sweet little bow! I should look into that Summer School next year, it looks fun! Your Fritz is a cutie too! Thanks for playing with our Tic-Tac-Toe challenge this week! 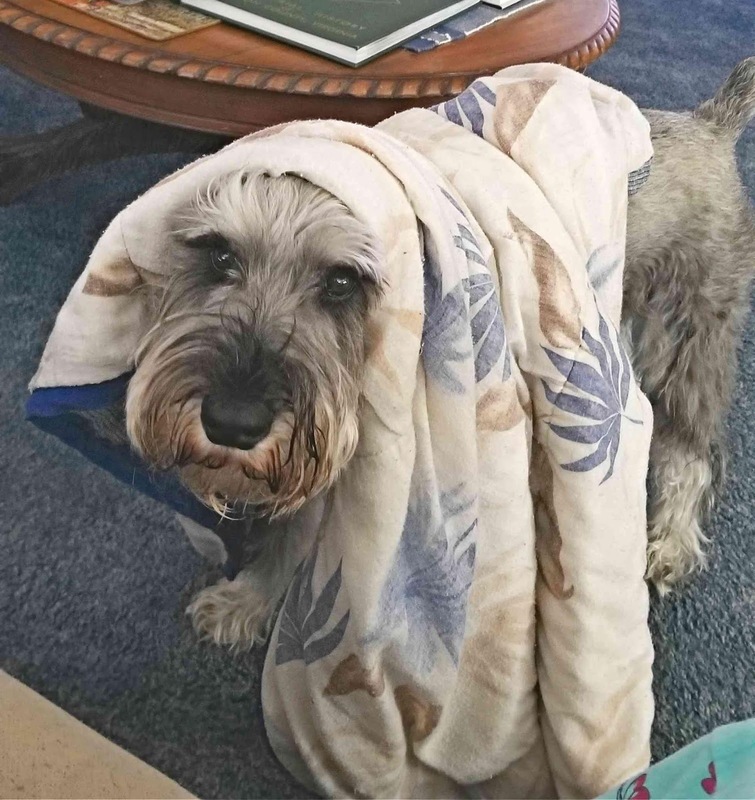 Love all your designs, and your dog Fritz is adorable. Thanks for joining Retro Rubber Challenge! Your cards are all splendid, the tag, the Christmas card, and the spring wreath with the pretty flowers! Thanks for sharing that funny picture of Fritz, it made me laugh! Omg, Fritz!!! He's adorable!! And your cards are stunning! 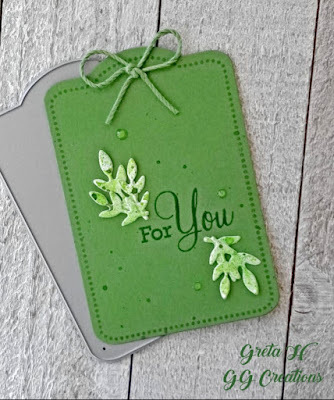 I loooove the green touches, and loving that tag shape for your first project! Your neighbor is very lucky :) Adore the stitching on your second card and loving the color combo on all of these!